There is no excuse, everybody was under alert. Google had already told us its preference for a web app development or responsive sites. It all emerges now after the Mountain View company has announced an update of its searching algorythm to be effective since April 21st. Watch out! You may be punished if your website is not mobile-friendly enough. What does this mean for you? We’ve tried to recap all tech specifications Google has made public about the update. Pay attention and don’t worry if you’re not a techie. Just visit the above link and enter a URL address to test if that website is optimized for mobile navigation. 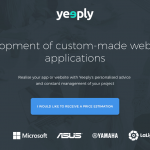 For Example, if you type Yeeply.com you’ll find out that our site is ready for Google’s ‘apocalyptic’ update. OOOOPS! Your site is not mobile-friendly! You don’t owe a responsive web! This means the new algorythm will take seriously those websites already optimized for mobile devices navigation, such as smartphones, tablets and even wearables like smartwatches and others. A very important tip for online marketing professionals and SEO experts. Don’t wait to test if your website is already adapted. Anticipate to Google’s update by building a web application that adapts to mobile devices. By implementing this update Google is confirming the set of a new trend when it comes to browse the web. Now, mobile is first. The search engine doesn’t not want to show users search results with non-responsive websites in order to avoid the access to non adaptative portals that provide bad user experiences. Over 60% of Google searches come from mobile devices, that means Google’s reply to those queries must be as well optimized for mobile. It is estimated that if you haven’t got a web application you may suffer a traffic lose up to 60% of your audience.